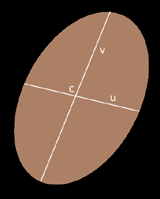 Planar ellipses (I add "planar" to make it clear it's not a 3D ellipsoid) are constructed by a 3D position c in space and two perpendicular orientation vectors u and v that define both the plane where the ellipse lays and the size of the axes. 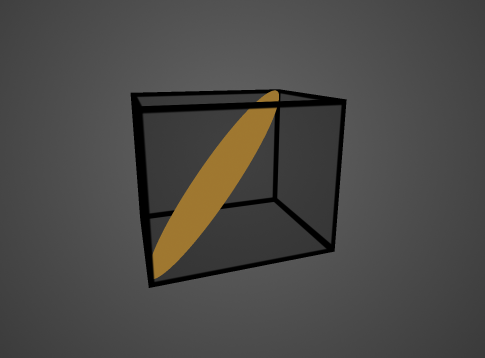 So you can store a 3D ellipse in 9 floats (8, if you are careful). In the case of the ellipse being degenerated to a disk, then a single orientation vector is needed (perpendicular to the plane containing the disk) and a radious (so, 6 floats). Planar ellipses can become very useful for computer graphics. For example, they appear when you cut a cylinder with a plane. They also appear when rendering point clouds with a splatting algorithm, or when raytracing point clouds. They can also help in realtime ambient occlusion and indirect lighting computations, where occluders can be approximated by a pointcloud. Ready for building your acceleration kd-tree for point clouds?